Temperatures are set to rise by up to 10C this week after days of frosty and cold weather hitting the country. Met Office forecaster Becky Mitchell warned temperatures could go as high as 11C today and up to 15C by Thursday. It is thanks to an area of high pressure pushing the jetstream above the country and allowing mild winds to sweep through from the south. Ms Mitchell said: “As the day goes on, clouds will gradually spell their way south. Any thicker cloud we could see some rain. “Particularly this band here across Scotland and Northern Ireland first as it travels its way south to northern England and continuing to make its way south. “But it should stay reasonably dry today but fairly cloudy and in the afternoon Scotland and Northern Ireland could see some brighter skies. “Temperatures will be on the mild side. Highs of 11C or 12C but it will be quite breezy, particularly in the north-west, that could take the edge off those temperatures. “So for your journey this evening it could be wet one for parts of northern England and northern Wales but for many still fairly dry and fairly mild. “Looking ahead to tomorrow it brings much the same, perhaps some early rain for north-western areas. 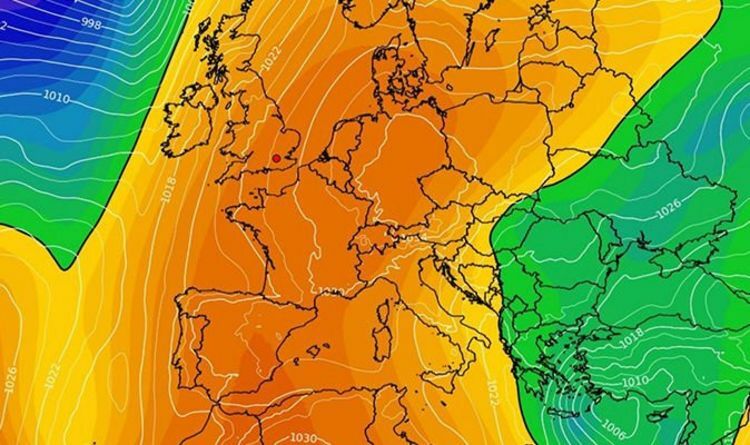 Meteorologist Carol Kirkwood also told BBC Breakfast viewers there will be some rain in the north as the weather fronts move in, but high pressure will keep things mostly dry in the south. Turning to her satellite footage, she added: “Look at how the yellow start to push across all of the UK. It will be particularly cloudy across Northern Ireland, Scotland, northwest England and Wales during the early hours of Tuesday. While the best of the sunshine and the longest spells of bright weather is going to be in the south and east of England. A few spots of rain are possible in the north-west, especially across western Scotland, where the weather front is pushing southwards into northern England during the course of the day. But the southwesterly breeze will help break down the clouds and clear the showers, leaving areas brighter by the afternoon. Top temperatures today are predicted to range between 10 to 13 degrees Celsius, which is a little above average for this time of the year. The heat value will be relatively the same on Wednesday, although there is going to be some outbreaks of rain across the far north of Scotland. Despite the prediction of warm weather and clear skies, some forecasters expect snow to return later this month.